Everyone needs a best pal. Just look at all of the important duos throughout history! Peanut butter has jelly to rely on. Macaroni has its cheese. And hamburgers have their fries… okay, so maybe we were kind of hungry when we made this comparison, but it still holds true. Just as all those food combinations need their better half, Han Solo from the Star Wars movies needs his pal Chewbacca if he wants to get through the galaxy in one piece! Han and Chewie met during one of Han’s dangerous escapades and they’ve been inseparable since. They cruise in the Millennium Falcon together. They take on dangerous missions together. They even fight infamous bounty hunters together! If it weren’t for Chewbacca at Han’s side, he’d have been caught by Jabba years ago. So then, who’s your number one partner? Is it that little dude who seems to follow you everywhere? Now, you can turn your child into the best wingman that an intergalactic smuggler could ever ask for! This officially licensed Solo: A Star Wars Story Chewbacca costume transforms your child into the Wookiee from the movie. It comes with a jumpsuit that has printed fur on the exterior. It also comes with a bandolier, which has printed details and a faux pouch attached to the end of it. 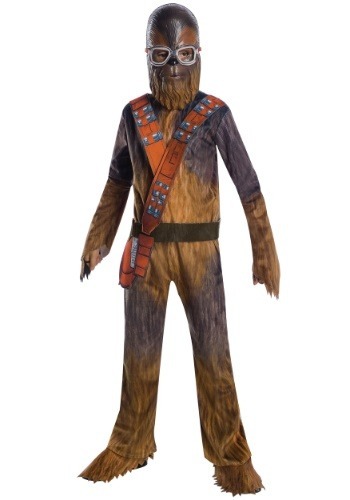 The costume even comes with a mask, which helps your child look like the real Chewie! Just suit up your little guy in this Chewie costume and there will be no end to the number of crazy adventures you two can cook up! Will you escape the from the clutches of Jabba the Hutt, or will you take on a heist mission with Qi’Ra? Who knows? Maybe you two could even become heroes of the Rebel Alliance.